For the past 10 years I have been working with various organisations to humanise the workplace, help improve the leadership capability and dampen the toxic culture that may currently exit. A recent article (28 Oct 2015) in the news has provided no relief. The article indicated that the thinking and culture of tomorrow’s leaders being taught at school’s today still resembles ‘traditional’ management of command and control borne out of the industrial era and Taylorism. Traditional command and control is about managers telling subordinated what to do, when to do it, where to do it and how to do it. There is very little thinking required of the subordinates and very little autonomy in this hierarchical culture. Just remember your parents work for mine, so don’t go complaining to them. Remember to say ‘hi’ to me when I’m your boss one day. This type of thinking is a big contrast to modern management and leadership styles of ‘Servant Leadership’ where the leader is servant to those they work with. The student’s comment resembles Level 1 of John Maxwell’s 5 Levels of Leadership. 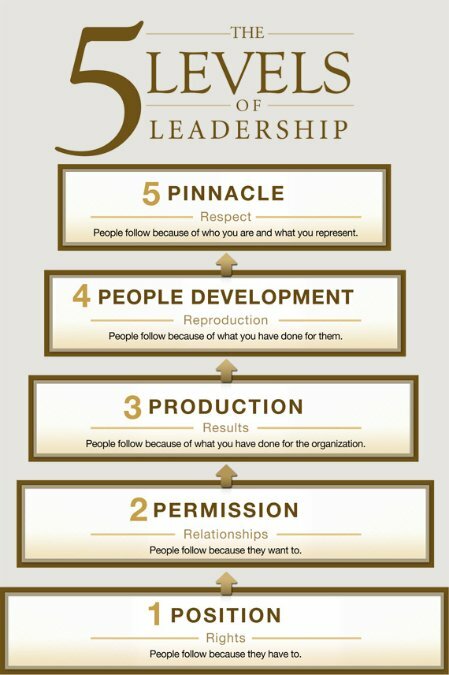 Level 1 is more about “hierarchy” rather than “leadership”. There is a real leadership debt in some organisations. We have too many leaders who work “in” the organisation rather than working “on” the organisation. Organisations and machines don’t build great products and services, people do. It is the collaboration and the human spirit that are at the heart and mind of great work. We need to stop viewing people as ‘resources’; treating them as robots or commodities who are easily interchangeable. We need to enable performance rather than manage performance. Humanising the workplace is about making a work environment that puts a greater emphasis on knowledge, passion, inspiring people to collaborate towards common goals, and fostering teamwork where creativity can flourish. Leaders have a large role to play in humanising the workplace. Effective leaders are increasingly collaboraters rather than being command and control. Effective leaders realise great outcomes from setting appropriate context, rather than trying to control people. Modern leaders provide vision and purpose that allows individuals and teams to be self-organising and self-disciplined. It’s not about “managing” people but more about “leading” people and being more facilitating. We need a different style of leadership. A style of leadership that respects the people’s intelligence, that explains these complex issues and then sets out the course of action we believe we should take and makes a case for it. We need to stop accumulating more leadership debt and start erasing this debt in schools so we can survive the challenges of today and tomorrow and build better world for the future. HI Chris good post….though I would say that the kids being quoted probably didn’t pick that up in school….. Thanks Phil. Possibly not, but the schooling system should be exemplars of effective leadership values and culture.